08.03.08 Like the Polgar National Invitational, the Denker brings together state champions from across the nation to compete in this "Tournament of Champions." In round 1, the Maine representative at the Denker Fritz Eyerer, was defeated by USCF Expert Robert Lau (2171) of Hawaii. Eyerer will face Lorenzo Newell (1102) of Mississippi in round 2. 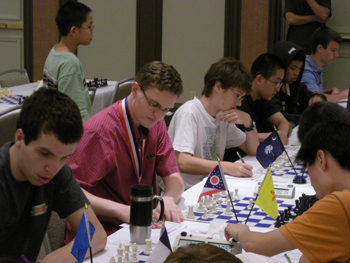 Players face off in the Denker Tournament of High School Champions at the Westin Park Central Hotel in Dallas, Texas. Round 1-Saturday, August 2, 2008. Same time as evening round of US Open. Round 2-Sunday, August 3, 2008- 11AM. Round 3-Same starting time as evening round of US Open. Round 4-Monday, August 4, 2008- 11 AM. Round 5-Same starting time as evening round of US Open. Round 6-Tuesday, August 5, 2008- 11 AM. Denker Awards Ceremony- 4 PM. The time control will be 90 minutes per player with 30 second increment added per move. This is the approved FIDE time control.